Pangara is a freelance platform that connects the top cream of developers in Vietnam with potential clients across the globe. The platform is designed to break the geographical barrier between tech talents and their clients worldwide. It is a smart and reliable channel crafted to build trust between developers and clients. The platform uses a unique, customized qualification process to ensure they present world class freelancers out the. As a freelancer, Pangara is open for anyone to apply for assignments globally. On the other hand, for companies or clients, the platform is the best way to connect and work with true tech talents. It’s a market place that fosters the talent-client interaction to create a win-win scenario for both. Pangara connects freelance developers in Vietnam with global clients. The platform uses customize, unique tests which ensure only the best out of the freelancer network in South East Asia make the cut. For this reason, its benefits can be classified into two broad groups. Client side and freelancer side. 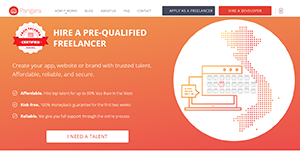 As a client, you have a lot to expect from this freelancer platform. First, all the freelancers in the platform must wade through a tough qualification process. This ensures you work with only the top talents. The freelancers not only possess brilliant communication and technical ability but also have a proactive mindset that keeps them highly motivated. The platform also accords personal contact with client’s right from the initial stage to project completion. You will remain in touch with a local team that possesses a commendable understanding of the local freelancer market. This ensures you get a unique quality per price ratio. On the other hand, freelancers have every reason to join this platform. It presents the perfect opportunity to work with renowned Scandinavian clients. It is one of the best channels to join the most exclusive class of freelancers in Vietnam. The platform molds you into a brand and makes you super competitive. In addition, all freelancers get the best market rates. Moreover, the payment process is safe and well proven. If you are considering Pangara it could also be beneficial to check out other subcategories of Best Freelance Platforms gathered in our database of SaaS software reviews. Since each organization has specific business needs, it is advisable for them to abstain from seeking a one-size-fits-all ideal software solution. Needless to say, it would be futile to try to find such a platform even among market-leading software platforms. The smart thing to do would be to jot down the various important factors that need consideration such as key features, finances, skill levels of staff members, company size etc. Then, you should do your groundwork thoroughly. Read some Pangara reviews and check out each of the other systems in your shortlist in detail. Such in-depth groundwork can make certain you discard ill-fitting applications and zero in on the system that provides all the aspects you require for business success. How Much Does Pangara Cost? Pangara is a free-to-use freelance platform, and offers no enterprise pricing plans to consider. We realize that when you make a decision to buy Freelance Platforms it’s important not only to see how experts evaluate it in their reviews, but also to find out if the real people and companies that buy it are actually satisfied with the product. That’s why we’ve created our behavior-based Customer Satisfaction Algorithm™ that gathers customer reviews, comments and Pangara reviews across a wide range of social media sites. The data is then presented in an easy to digest form showing how many people had positive and negative experience with Pangara. With that information at hand you should be equipped to make an informed buying decision that you won’t regret. What are Pangara pricing details? What integrations are available for Pangara? If you need more information about Pangara or you simply have a question let us know what you need and we’ll forward your request directly to the vendor.